Reigniting the fire in your employee incentive programme can ensure your business is on the right track throughout the year. With 22% of employees leaving their current positions due to an enhance remuneration and benefits package being offered by a new employer, a sure way to show your workforce that their hard work hasn’t gone unnoticed is through on-going employee rewards. Not only is this a small token of your appreciation but it also improves your employees engagement, productivity and creativity levels. With the right incentive scheme you can ensure the happiness of your employees and ultimately, have a better bottom line for your business. Attempting to tailor your incentive programme to suit all your employees needs can seem overwhelming, but providing your team players with gift cards or e-Gift cards will give them the freedom to purchase something they’ve wanted for a while. 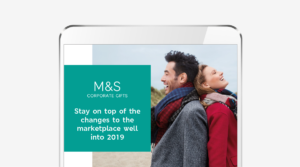 Empower your employees with the freedom to express themselves – get them an M&S Gift card, and let them spend it well in 2019. To find out more on how to improve your employees wellbeing with M&S Corporate Gifts, submit an enquiry or give us a call on 0330 0580 734.